Portland's a grand playground of culinary innovation. But some things, well, some things are best left simple. 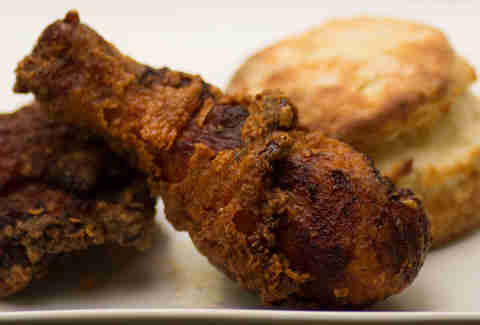 Fried chicken is perhaps the ultimate comfort food. As such, there's no real reason to gussy it up beyond a few secret spices. 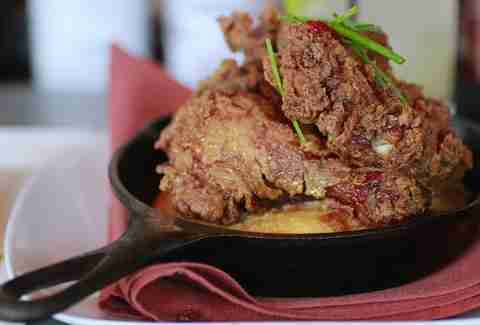 The below list includes the best old-school fried chicken options. By old school, we mean, like, one-room schoolhouse. That means we're excluding some fantastic meals for being boneless (sorry, Country Cat and Screen Door), or for selling just wings (we still love you, Fire on the Mountain). You will find no lollipops or other fancy/cute variations. 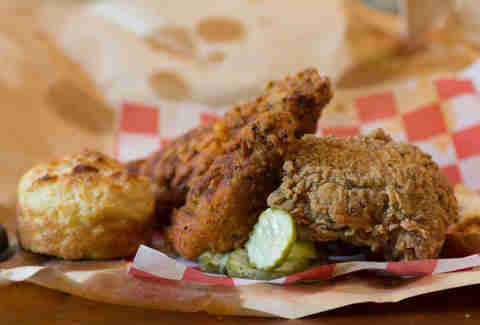 Only the best old-school, boney, greasy, breaded fowl this city has to offer. While it’s generally a good idea to bank on a restaurant that prominently displays a happy version of the animal that died so you could be happy -- and the smiling chicken mascot is just that -- this deep-NE semi-roadhouse seems to have farmed its chicken from a farm that specializes in the poultry equivalent of miniature shih tzus. The breading is thick and crunchy, but it’s sadly more substantial than the actual meat. We recommend the gizzards, or just stick with the fish & chips here, even if they’re not actually on the sign, smiling at their own demise. 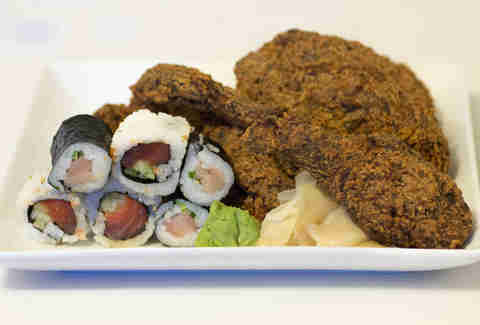 Sushi & fried chicken doesn’t exactly sound like a traditional surf & turf combo, but it’s what this fluorescent, fish-tanked Mississippi spot puts front and center. There are some contrasts between the raw fish and the fried bird, the latter of which is pretty straightforward, but with a hint of ginger manages to give off a burnt taste. 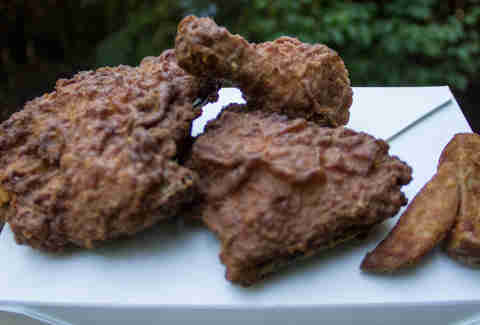 The chunks, however, are enormous, even if the half-bird’s pieces tend to vary from juicy to dry. That’s what the sake’s for. 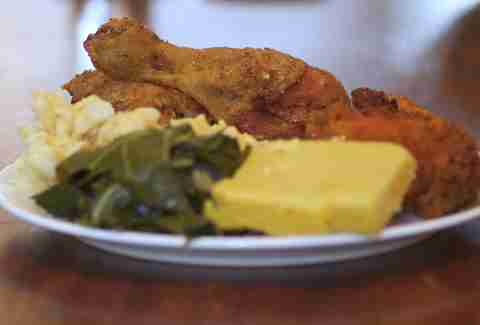 A wholesome little soul food spot that you can feel good about supporting (it’s run by a church! ), PoShines does wonderful things with everything from catfish to ribs. 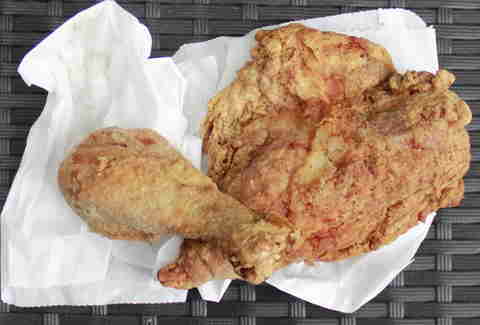 The fried chicken, however, can be inconsistent. A recent visit to satisfy a craving found the chunks to be impossibly soft, as if they had been slow cooked before frying. The result was fall-off-the-bone tender, which isn’t a bad thing for ribs. 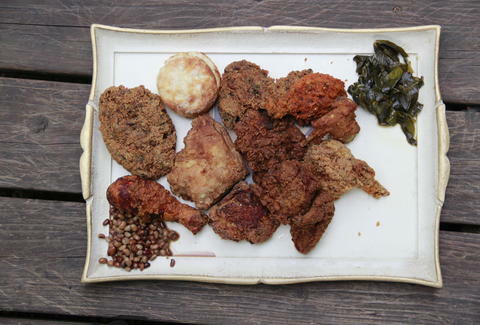 For fried chicken, it’s a recipe for a dry-cleaning bill. Still tastes great though! This new-ish Southern meat & three in the old Tiga spot balances fancier fare with the lowbrow, and gets extra points for offering bacon as a side. But at $13 for a two-piece (dark), you kind of expect the chicken chunks to be a little bigger than the mini bird served up with a choice of regular or Nashville hot, which is actually fairly mild. It’s a solid recipe, but you might need to double down on your order. To the untrained eye, this unassuming little convenience store at the corner of N Albina and N Alberta just looks like your standard convenience store. But if your eye is drawn to the glow of the heat lamps in the hot case, you'll soon discover that massive, surprisingly good pieces of fried chicken are available at the counter, right next to cough drops and condoms. There's nothing remarkable here, and that's kind of the point. This is fried chicken as comfort food, and the best grab-and-go non-wings (the wings honor goes to Alberta Market) available in a place that also sells Wild Irish Rose. This divey little joint looks like it was swooped up by a tornado in the Midwest and plopped on the outskirts of Multnomah Village, where cold pitchers pair up with the kind of gigantic chicken dinners that contribute to half the country’s obesity rate. The pieces are enormous here -- a two-piece could probably match an eight-piece from the Colonel -- and the small-town vibe is downright wholesome. An inconspicuous little corner dive specializing in cheap beer, loud sports, and Jell-O shots, George’s is a true gem and possibly the least pretentious bar in Portland. Its basic, massive chunks of chicken are exactly what you’d expect: meaty, salty, crispy, and no frills. Oh, and it's served by the bucket. It's damn fine bar chicken best served during Sunday football. Chicken Little is a tiny counter shop/hole-in-the-wall next to a dive bar that serves up fried chicken that basically fits the dictionary definition. The breading is simple, thin, and salty. The chunks are generous. And I'll be damned if it isn’t even better once it’s cold. Some might ding the place for being dingy and dirty. Me? I think that the spotty cleanliness is part of the charm... and most germs don’t survive hot oil baths anyway. Available only on Tuesdays at the steak spot’s butcher counter, the LM chicken is thick and crisp, but what really sets it apart is the slight curry kick lurking in the breading, offering up an unexpected dose of flavor without compromising the old-school build of the meaty chunks. Even better, it’s served up cold and priced by the pound, making it perfect for a picnic in Laurelhurst. Or, you know, in your car. When the team behind Boxer Ramen, Hop Dog, and Blue Star set their sights on Nashville-style hot chicken, expectations were high. Now, after a probationary period where reviews were mixed, they’ve hit their stride, offering up perfectly juicy two-, four-, and eight-piece dinners in a variety of styles: simple salt/pepper, a hot version with a kick, and an extra-hot, bright-red version that will have you running for a side of mac for relief. Thankfully, the mac’s also delicious. The worst part about the Delta is the sadistic choice between one of the city's best chicken-fried steaks and the chicken. But the thick buttermilk variety here is worth the sacrifice. It's the kind of stuff mom used to make. But probably not your mom, unless she's an old-school Savannah Civil War widow. And it's best paired with a Champagne bucket holding a 40. Also just like in the Civil War era. If you're bemoaning the absence of Screen Door on this list, 1) remember, we've got a no-boneless rule here and 2) there's great reception in that line, isn't there? Anyway, the chef at this theater district spot is an alum, and he's got a recipe on par with that brunch-time classic. His take is a happy hour-only treat brined in sweet tea and served in a skillet of cornbread with a side of smoked butter. It'd be worth the line to get it, if there was one. Portland’s notorious Reel M Inn is a thing of beauty. It’s an old-school dive bar that stands in direct contrast to all the upscale restaurant development enveloping its neighborhood. The drinks are strong. The customers are surly. And the chicken is a thing of beauty. 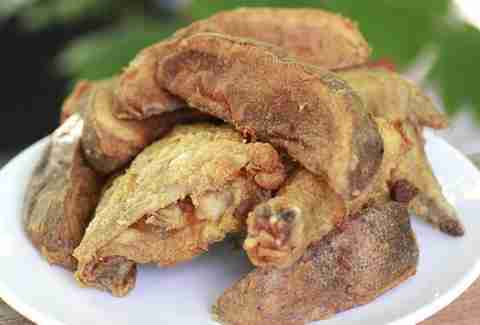 Huge hunks with just the right amount of seasoning are dropped into the place’s single fryer and cooked to perfection. Give your order 20 minutes to fry. And then heed the bartender’s warning not to bite into it for at least 15 more. That’s the perfect amount of time to marinate yourself in whiskey before biting into a hunk of bird that’s rightfully been lauded for decades. When you’re looking for great fried chicken, logic would dictate that you trust a restaurant run by a rapper whose rhymes are largely about weed. Dub’s -- formerly Mac & Dub’s Excellent Chicken and Waffles, currently one of our favorite soul food spots in the US -- is located in a small window inside the dubious Ranger Tavern, but even if it was located in a garbage-burning plant, it would be worth the trip. 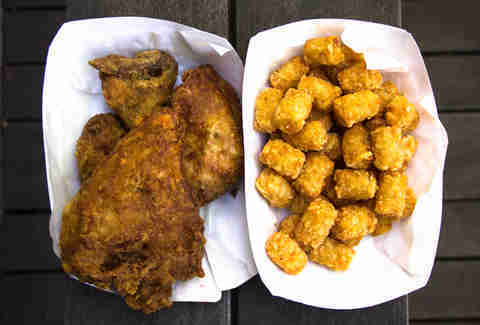 Plump, juicy hunks of chicken are the golden standard by which most soul-based chicken should be judged. Oh, and the waffles are some of the best in the city, too. I didn’t want to put an $18 chicken dinner -- sides not included -- on this list. I really didn’t. 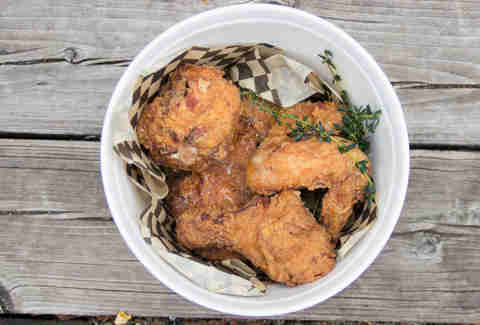 But here’s the thing: Woodsman’s literal bucket of chicken -- it's served in a KFC-style bucket to go and a metal one in the restaurant -- takes everything you love about fried chicken and amps it up. The meat? 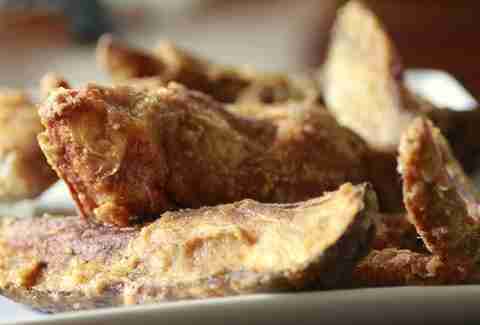 Perfectly fried, with the juices locked into the premium bird, which is cut up into five generous pieces. The salt -- so essential to fried chicken’s lifeblood -- takes the form of mini rocks of sea salt by Jacobsen’s. And the breading -- occupying the zone between crisp and light -- is kissed with a smack of honey which, when mixed with the salt, takes it into a danger zone hovering near meat-candy perfection. It’s huge. It’s satisfying. 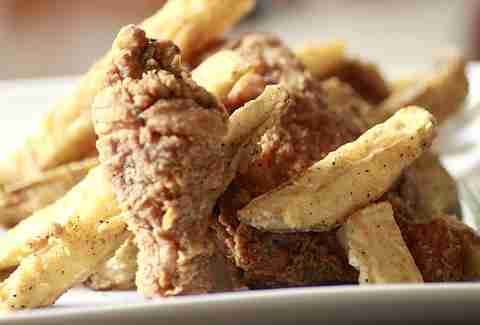 And, moreover, it will make you fall in love with fried chicken all over again. Andy Kryza is a senior editor at Thrillist. The sprig of herbs on the picture above is the closest thing he's had to a vegetable in a week. Follow his slow decline: @apkryza.